We already know that Maine’s wedding vendors are a talented and professional bunch. But what we don’t know is how 2011 is shaping up for them and what they expect for their businesses next year. That’s why our own Love & Lobster has teamed up with Real Maine Weddings, the Maine Wedding Association and Tide Creative, a Maine-based wedding marketing and consulting firm, to conduct the State of Maine Wedding Industry Survey. 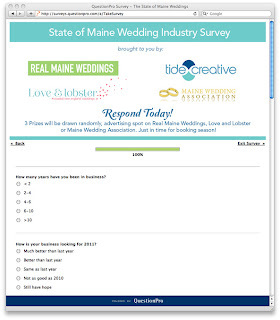 The survey is open to any Maine business that works in the wedding industry, and we invite each and every one of you to participate. Spend about a minute answering 11 quick questions, and you’ll be among the first to learn the results by the end of November. The survey ends on November 4th. Plus, we’re offering three prizes to help kick your booking season into high gear. We’ll draw winners at random for advertising spots on yours truly, Love & Lobster, as well as on the websites of Real Maine Weddings and the Maine Wedding Association. We want to hear from you! Please, take a moment to tell us about your business at www.stateofmaineweddingindustrysurvey.com.